The Biblioteca Antonelliana is called after Cardinal Antonelli, its founder, who in 1767 left all his books to the public administration of Senigallia, for the opening of a public library. His heirs contested the will and it was not until 1825 that the library opened. Since then it has acquired the libraries of various suppressed religious orders, and benefited from the wills of local citizens, both priests and aristocrats. The library possesses not only books but manuscripts, and I was privileged to be allowed to see some of its greatest treasures. This manuscript is, according to the catalogue, Patriarch Joseph III’s Chaldean missal with the Nestorian liturgy. Presumably this was Patriarch Yosep III Maraugin, who was in office from 1714-57 (or -59), and could therefore have known Antonelli. Apparently the Patriarch had a copy made from a thirteenth-century original used by the “heretical patriarch Elias, whose name can be read” . It is not clear to me whether this is the original or the copy. Here are four pages from the liturgy. This is a 14th century cantorino of the Office of the Dead. A cantorino is a book of liturgical chants with music. The script is Bolognese Gothic, which was in use in Italy from the twelfth to the fourteenth centuries. Translation: “that he be not made to suffer for any wrong he may have done; for he always desired to do Thy will. And as the true faith numbered him here among those who served Thee, so let thy mercy find him hereafter a place among the choirs of Angels. O God be mindful of me, for that my life is but wind, nor the sight of man may behold me. Translation. ” [Blessed is he] who cometh in the name of the Lord. Hosanna in the highest. Lamb of God, who takest away the sins of the world, have mercy upon us. Lamb of God, who takest away the sins of the world, receive our prayer. Thou who sittest at the right hand of the Father, have mercy upon us. Thou only art holy, thou only …”. You can see that there are two different hands here, and it looks as if , in an attempt to substitute a missing page, the Agnus Dei (well over halfway through the Mass) and the Gloria (near the beginning) have got mixed up. 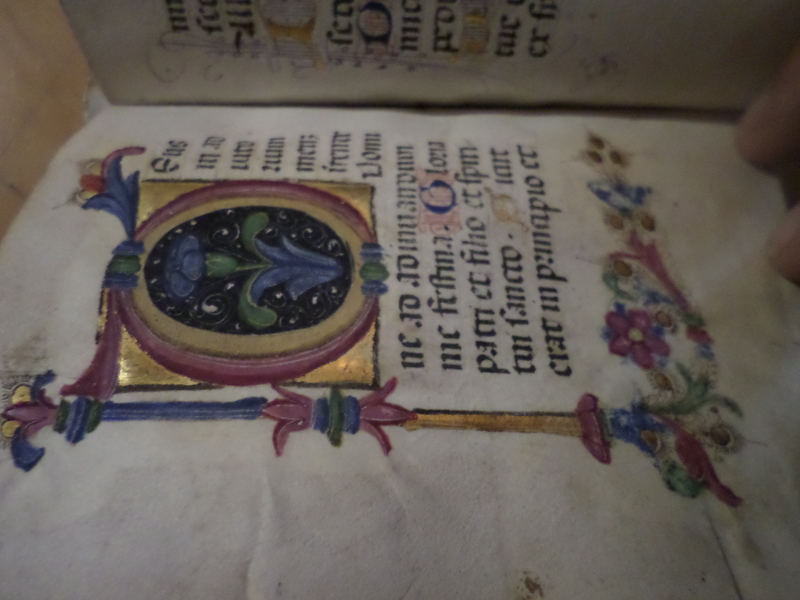 Below is a fifteenth-century illuminated Book of Hours, a collection of devotional text for private use by the laity. Its central nucleus is the Hours of the Blessed Virgin. The script is Gothic Rotunda, in use in Italy, southern France and Spain from the twelfth to the fifteenth centuries. 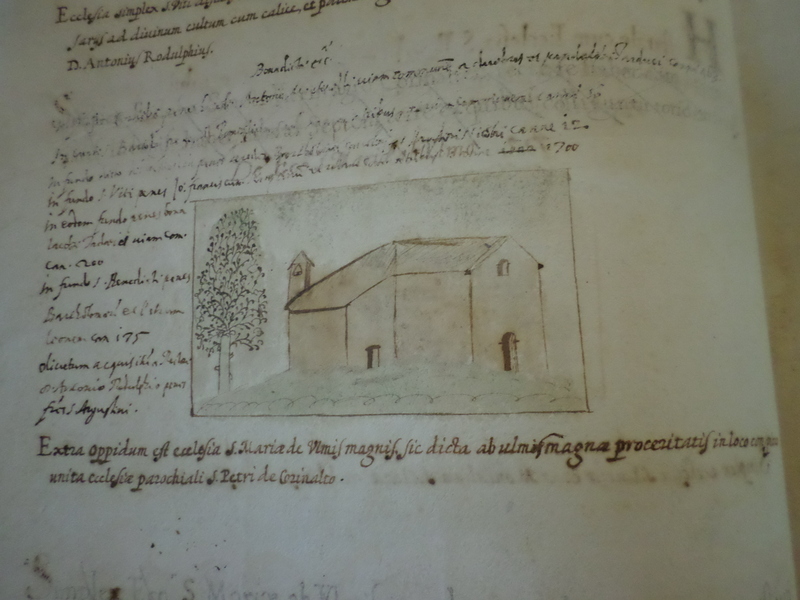 This photograph shows an illuminated D.
The last manuscript I saw was Bishop Pietro Ridolfi da Tossignano’s “Historiarum libri duo” (Two volumes of histories) which, as well as a history of Senigallia, contains the results of his episcopal visitation, or inspection, of its diocese. According to Marinella Bonvini Mazzanti in Volume 1/1 of “Collectio thesauri”(the exhibition catalogue of the treasures of Le Marche’s libraries), Ridolfi, a man of the Counter-Reformation, was actuated by a passionate desire to revive the spiritual life of the diocese and, presumably, to rescue its churches from neglect. He describes all the places of worship in the diocese, including Corinaldo, with illustrations by Gherardo Cibo and two others. Thus Ridolfi’s work has become an invaluable historical document. Here is its title page. 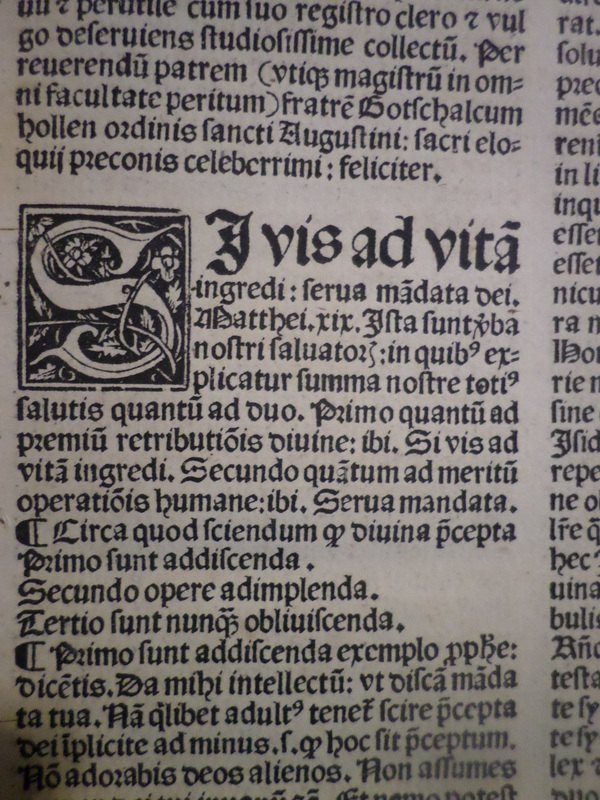 In fact the book was probably actually finished in 1601, the year of Ridolfi’s death, so he never had it printed. It has now actually been printed in August of this year, but the official launch is planned for later this month (September). I didn’t see any more manuscripts but next time I’ll tell you about the early printed books in the Biblioteca Antonelliana. Thank you for the Reblog, Stefania! 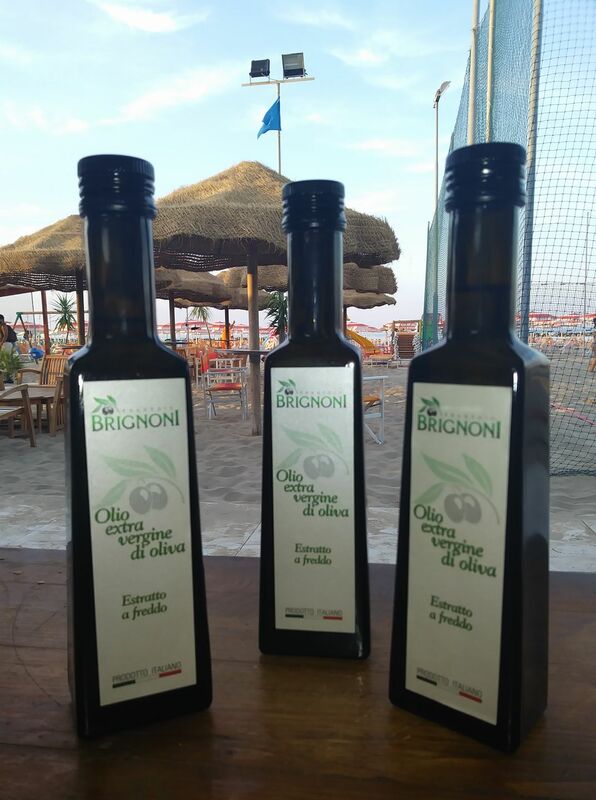 Next Next post: The Englishwoman visits Senigallia’s Biblioteca Antonelliana. 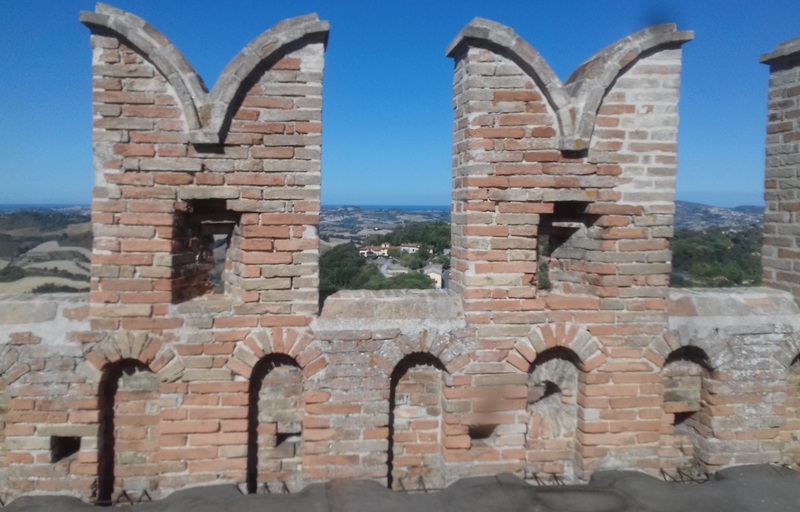 Part II: Corinaldo’s churches.